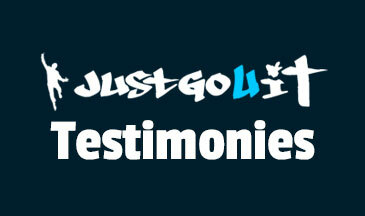 Testimonies…….. – ..:: Justgo4it! ::..
U bevindt zich hier: Home / Blog / Nieuws / Testimonies……..
1. Today in my car, a man addicted to cocaine for 15 years, gave his life to Jesus. When I told him that God wants to be his Father, he broke down. We’re going to meet regularly now, to build a relationship. Yes, to me this is discipleship. 2. The weekly discipleship training is fruitful. Next is a short testimony of Ichene, one of the men I’m discipling. Yesterday, a young lady gave her life to Jesus Christ. She also had a lot of back pain because of stress. She asked me to pray for that too, and the back pain and stress are gone. Today I was talking about the freemasons with someone, and my grandpa was also there. I asked him: ,,Have you ever asked someone to pray for that, so that the spiritual world behind those freemasons can’t hold you anymore?” He said: ,,No, but can you pray for me? I’m starting to feel a bit strange.” Of course I prayed and after that he felt fine. My conclusion: JustGo4It! 3. Joan and me were drinking some coffee, we had a great time. God said to me: ,,I want to say something to the woman behind you.” I thought: yeah right, but that feeling didn’t go away. Eventually I went to the table where two ladies were talking to each other. I said: ,,I’m not a fortune teller but I’ve got this feeling about you, can I tell you what it is?” When I told her, her jaw dropped, everything was right, and it made her so happy! That’s what prophesying does. It was a great encouragement for her, and I was allowed to be a channel of His Love. 4. Joan works in the kitchen right now with the best cook of Curacao. His name is Mr. Pisas. At noon, food and clothing are distributed. It’s like a food bank for the people of Soto and the area. It’s organized by www.siloamvillage.org and they’ve been doing this for years. As you know we live with Siloam and we work together. The kids are playing and daddy’s going on right now cleaning the house. Have a great weekend everyone. 5. I’ve prophesied over several people today, and preached the gospel to two older ladies. I explained to them that Jesus isn’t the church, so today I was the church wherever I was. It was on a terrace and on the streets. It’s 24/7 and it just continues. Tomorrow I’ll be the church again wherever I’ll be. As you know, we came to Curacao four and a half years ago to support YWAM to build a home base. Unfortunately, Immigration Service didn’t grant residence permits for workers of YWAM and the director and his team left the island after three years. After a while of searching, ‘What to do now, how to do this’, it slowly became clear. We are living in Soto for two and a half years now and we’re working on the purpose that brought us here: to guide people with addictions, and disciple them, and help people in need. Since 2001 (when we followed a DTS in Amsterdam), we’re following Morningstar and founder Rick Joyner. We love the way that the organisation deals with people, their passion for missions and it’s prophetical aspect. For a couple of years we’ve build a relationship with Jorge Parrott, director of mission of Morningstar. That relationship has grown in a natural way and they look at us as missionaries of their spiritual care. Their prayer teams pray for us daily and we get healthy feedback on questions. We’ve been invited as a family to come to North Carolina, USA, to get to know each other better. They also want to send teams to spiritually and emotionally support us. As Director of Missions for MorningStar/CM Missions, I highly recommend Henk Kempers as a great man of God. Henk has a real heart of integrity, and great love of Jesus for the people he ministers to in Curacao. Henk is faithful and hardworking, honest, and has proven trustworthy the last 5 years I have known him. We strongly recommend Henk in his work serving the less fortunate, helping those with addictions and recovery, and offering hope and help to many people. He is accountable, teachable and always ready to help in a time of need. Feel free to contact me at officecmm@gmail.com or call 704-517-2557 for further questions. We’re really happy with the people of Morningstar and we appreciate their friendship and support! 7. ,,My body was a squat of evil forces. I’d been involved with ‘innocent’ psychics, tarot cards and occult movies like ‘The Exorcist’. I was also a serious heroin addict. When people on the street asked if I would choose for Jesus, the squatters started screaming from within and went violent.” Henk Kempers, of the foundation JustGo4It, is speaking. After a radical conversion, Henk works as a missionary at Curacao. Kempers used soft and hard drugs, began hearing voices in his head and was in a psychiatric clinic in Raalte, Holland. He found himself involved in demonic forces – in punk scene. This had one major cause. ,,I was looking for negative forces because I didn’t get what I wanted: to hear from my father that he loved me. Neither did my mom ever say that. Now I know that it’s because they never learned it themselves. Hugs or saying loving things weren’t a part of them. They were from a generation after the war and show their love by doing nice things, like going to a playground. ,,When God touched me, I felt dirty. I smelled the stench and started crying like a little child.” The next day, Henk went to church, even though he didn’t really want to. When he was there, the next confrontation came up. He wanted to escape the church to get away from the songs about the blood of Jesus. Every time he got encouraged to stay and at the end of the service he decided to let people pray for him again. ,,I showed my hand because I wanted them to pray for me. The elder that had been praying for me the night before, said: ‘All children have to leave now.’ The adults remained and the whole church started praying out loud. I heard strange languages, they looked like Russian or Chinese. Something inside of me became really angry, but I surrendered. ‘Jesus, here I am’, I said. I fell backwards and started to manifest. People were holding me and someone was even sitting on top of me, and said: ‘Henk, you need to choose now, so the strong man who’s closing up everything from within, will leave.’ And then the heavenly military unit came back. Verslaving is een keuze Het werk gaat door!